To sign up to The Camouflage Company - Home & Garden Storage Newsletter, simply click the Request Newsletter button below and you will receive amazing special offers, discounts and access to secret sales. Welcome to the The Camouflage Company, the unique creation of sisters Corinne Laurie and Louise Unger. The Camouflage Company began with the now-famous botanical garden covers. Soon joined by bags and boxes, space-savers, caddies and trays, all the products conceal, store, save and maximise space. Imagine large zipped boxes that go straight from your wardrobe into your suitcase: no more unpacking on arrival! Picture pretty totes with foldaway bags inside: so handy when shopping. There’s even a ‘cupboard in a bag’ you can pop in the boot for a weekend escape. Everything is strong, lightweight, versatile. Designed with clever little touches to make life easier. Corinne and Louise handpick the chic prints: daisies, summer meadows, Van Gogh’s Sunflowers, classic blue gingham, rose petals, vintage florals and more. For home, work, garden, garage, kids and the car, shopping and travel, your search for super storage ends here. Goodbye ugly boxes. No more 5p charge on throwaway bags. An end to clutter. At home and on the move, The Camouflage Company streamlines your life. Storage reimagined. Receive the latest designs and huge savings on beautiful storage - sign up to The Camouflage Company newsletter! The Camouflage Company - Home & Garden Storage Newsletter Jocelyn M. said: I ordered this with my new home in mind and love many of the products I have seen, but I havent moved yet. 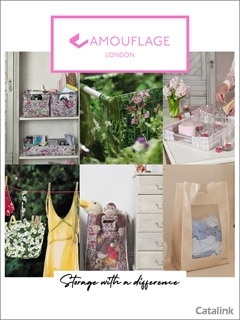 The Camouflage Company - Home & Garden Storage Newsletter Aka O. said: Lots good useful items. By Pressing the Request Newsletter button you give The Camouflage Company - Home & Garden Storage (and their Data Processors for the specific purpose of delivering your emails) consent to send you their newsletter via email until such time as you choose to unsubscribe.